Simply sign up for my Learn Japanese Adventure Newsletter below and download the free eBook. 100+ Common and Useful Japanese Phrases. 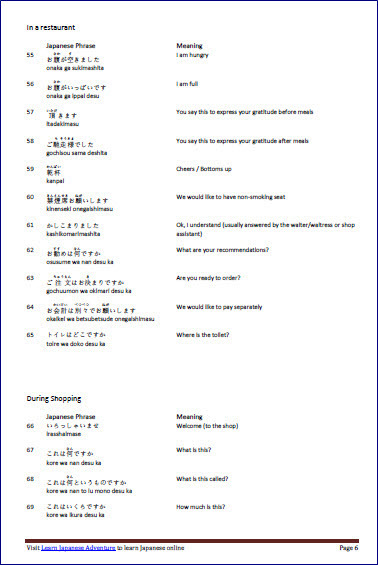 Regular bi-weekly emails containing different topics on Japanese learning. Some exclusive tips, resources, sites, which I think will be useful to you. You will be first to be notified of the latest content (new lesson, new vocabulary list, new faq answer) on this site. Information about special promotions, offers, new products and services. First dibs on my upcoming eBooks, courses. If I come across new stuff, materials, articles, or anything which I think can be beneficial to learning Japanese, I will love my subscribers to know it first hand. What is in this FREE eBook? 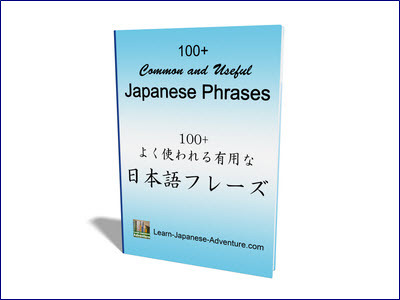 You will also receive a free eBook - 100+ Common and Useful Japanese Phrases when you subscribe to this Newsletter. All the Japanese phrases are written in kanji with furigana (kana) on top of each kanji. Romaji are also included to help in your reading. Below are the eBook cover and a snapshot of the eBook. You will receive an email asking you to confirm your subscription just to be sure someone did not submit your email address without your knowledge. Once you click the <Confirm your subscription> button in that email you will be taken to a "Thank You for confirmation of subscription" page where you can download your free eBook. You will also receive another email with a link to the "Thank You for confirmation of subscription" page in case you forget to download your free eBook.